In his email to Nantah graduates announcing the passing of Lee Kuan Yew, NTU President Bertil Andersson failed to mention Nantah. It saddened me and broke my heart. Nanyang Technological University is sitting on the site of old Nantah. If there is no Nantah, where can NTU find her beautiful campus? Professor Andersson paid his tribute to Lee Kuan Yew: “NTU owes much of our success as an engine of progress for Singapore and mankind to Mr Lee’s vision and stewardship of education… “. He also mentioned about Lee’s ‘personal interest’ in NTU development in its early days. The early days here mean the 1980s/1990s and not 1950s or 1960s. The email was addressed to Nantah alumnae on 23 March 2015. NTU President either intentionally or purposely omit the history of Nantah. Perhaps, he is ignorance about our past history - the SG50 story. Sucn an ignorance confirms there is no relationship between NTU and Nantah spiritually. It makes one wonder what is the rationale to date back the history of NTU to 1955. The university authority or the government has already had an agenda while for politically reason, they have to make this calculation. The omission of Nantah in the email clearly shows the double heads snake of the university/government. It wants to project NTU as a young university. However, for political reason, it has to try its best to associate NTU with Nantah. We have to admit the fact that NTU is occupying the campus of old Nantah. Some may even argue the occupation is illegal. Nantah story must be the most important liberal education for NTU students, perhaps for all students in Singapore. However, the President chooses to ignore the history. In fact, as a show of megre between Nantah and the University of Singapore, Nantah logo went to NUS and not NTU. It makes the issue complicated and creates another controversy. Up to today, I continue to receive newsletters from both NTU and NUS. Comparing to the pioneering batches of Nantah graduates, I am less attached to Nantah and have less Nantah spirit. Graduated in 1980, the very last batch of Nantah graduates, I was disillusioned by first the setting up of joint campus with the University of Singapore and then the officially announcement of Nantah closure. Helpless, disappointed, confusion, uncertainty and living in fear accompanied my 3-year of study in Nantah. Few people in the world would have this experience: seeing the death of Nantah and voiceless. NTU President certainly does not have such a compassion as shown in his email. Ignorance and omission of history is not the right way to solve the controversy. When we call for a united Singapore and prepare to march forward toward a better Singapore without Lee Kuan Yew, we cannot deny the truth and contribution made by Chinese in Southeast Asia. The PAP owes them an apology. The current PAP leadership will have to take a right move. The establishment of Nanyang University in 1955 was a social engagement and commitment. It was a kind of citizen engagement among Chinese in Southeast Asia. It went beyond Singapore. Who could predict such a positive citizen engagement and high hope fail to take off later under the PAP government? The Nantah spirit although hardly mentioned in SG50 is the critical success factor for Singapore. In many ways, LKY had cleverly used it or manipulated it to his political advantage. Citizen or social engagement like the establishment of Nantah has disappeared under SG50, especially after 1980. We have made economic progress but less so in social and political progress. It is time for the re-emergence of positive citizen engagement and political participation in Singapore. Citizen Engagement will move Singapore forward. The passing of Lee Kuan Yew will result to positive citizen engagement. Lee is credited for the success of Singapore but is also criticised for his strong rule. The success has come at a price which is ‘fear to speak out’. One can be detained without trial under the Internal Security Act. It creates a voice poverty. Hence, Singaporeans have to sacrifice social accountability, transparency, inclusiveness and responsiveness due to the closed decision making of the government. Singapore is a one-party state and is now a rich country. However, our press is not free according to Reporters Without Borders. Therefore, Singaporeans are rich but not happy. The ruling party, the People’s Action Party, maintains an elite and closed decision making cabinet. They believes their policymaking is the best. Even people oppose their policies, they will still implement them as they believe these will benefit Singaporeans at the end. Citizen Engagement has five constitutive elements: State Action, Citizen Action, Information, Civil Mobilization and Citizen-State Interface. The Singapore model only highlights the importance of State Action - the government knows the best. This unhealthy development makes Singapore looks like a developing country. The mainstream media is controlled by the government. The short route to accountability has no place here. People find no way to express as there is a closed information loop. During the one-week state funeral for Lee Kuan Yew, the only place for public protest at Speakers’ Corner was closed. Hence, free press or free expression as correct feedback channel is absent. So, RTI (Right to Information) Act in India questing about the uses of fund for constituency is basically not possible here. Even in social media, the government can ask the site owners to register with them. Hence, social audit is not possible. However, as the education system is quite well organised. We don’t have Uwezo Initiative problems. The government is promoting the best education and claims ‘every school is a good school’. However, this produces another problem - lack of creativity. Is citizen engagement a game changer? Yes. The passing of Lee Kuan Yew is a closing chapter for the closed decision making model. Singapore is already well developed and to move forward, citizen engagement can help to add more power to the country. The diversification/feedback will bring in creativity too. There is a limitation on technology contribution. In fact, Singapore government and Singaporeans know citizen engagement. Social media, NGOs, feedback channels, social audit and participatory budget are not unfamiliar here. We know the technology and hardware for citizen engagement. We are now demanding the government to relax the game of engagement. If ‘10% technology 90% politics and institutions’ is an indication, then in the political front, we have seen some changes. In 2011, the ruling party obtained 60% popular votes. However, due to the first past the post system, it still controls 90% of the parliament seats. This unfair power distribution results to more people want to change the system politically, socially and economically. The PAP government will have to adjust to this demand or to be replaced. We call it a ‘new normal’ which citizen engagement is part of it. Citizen engagement will have a new future. Without citizen participation and feedback, the government can implement its ‘own’ best but not the best of the people. This game changer has to take place in Singapore. Otherwise, Singapore’s sustainable growth will be limited by the PAP vision. SINGAPORE AFTER LEE: LESS IMF, MORE WORLD BANK? The World Bank Group is promoting citizen engagement for world development, especially in developing countries. Being a first world country, Singapore in fact does not need such an advice. However, in the past 50 years, despite economic success, our citizen engagement movements are like our press ranking far from satisfaction. It is a voice poverty similar to the asset poverty in developing countries. Singapore is very proud of her achievement over the past 50 years, naming from third world to first world in one generation. However, after increasing the aggregate utilities (wealth) to the top of the world, Singapore ruling party, the PAP, is now facing huge political pressure. People in Singapore are rethinking this utilitarian approach. Rich but not happy mean the welfare(well being, utilities) is not increasing anymore, i.e. marginal utilities not increasing. Perhaps, Singapore is now a high income country and people’s happiness will fail to increase when their income has reached a certain level, e.g. US$75000. However, Singapore has a very high Gini index - big rich and poor gap. The continued increase in total income and utilities will add more pressure to the lower and middle income citizens. Lee Kuan Yew created a model of ‘PAP knows the best’. Under this model, Singapore pushed for maximum utilities of economic growth. When comes to citizen engagement and consultation, the PAP only engaged people who can contribute to growth and increase their marginal utilities. People who disagree or make no contribution will have no say in decision making. Both IMF and World Bank offer mass open online courses over edX and coursera platforms. Singapore’s performance measured by IMF financial programming and policies and debt sustainability analysis is top rate, except perhaps, the issue of high public debt. However, when we consider the development approach under the World Bank guidelines, Singapore in many ways is a below average student. It is because WB considers risk and opportunity of transparency and accountability in a country. WB also wants developing countries to engage their citizens as a game changer for development. IMF considers less about citizen consultation and more about effective policy implementation, for example, an austerity program. It aims for short term and immediate solution. While WB concerns more about sustainable development, long-term effects. Hence, public participation and citizen engagement are important feedback loop. WB believes citizen engagement can improve policy making. And it involves social accountability, transparency and responsiveness. The PAP government is, in fact, actively engaging citizens but in a wrong way. It is using a ‘monopoly’ approach as well as ‘fear’ factor (ISA, defamation). It is very different from the WB model. The PAP has a monopoly in information. The mainstream media is under the government control. It also controls the labour movements, hardly any true labour/citizen engagement. The government’s feedback unit is collecting pro-government feedback. Almost all civic organisations - sports/trade associations, charity/religion bodies, NGOs, are headed by pro-PAP or government friendly people. WB citizen engagement has five constitutive elements. However, in Singapore, there is only one big element: State Action. Civil mobilization, information and citizen action are all under control or manipulation. The once powerful grassroots mechanism in the past has helped to maintain some degrees of citizen-state interface. However, the current grassroots feedback has broken as shown in the drop in popular votes in 2011. A ‘five constitutive elements’ balance became an unbalance of one super State Action element under Lee. This is not a sustainable situation and bad for the long-term development of Singapore. If we re-consider the public debt issue mentioned by IMF, it is in fact also a citizen engagement issue. The Monetary Authority of Singapore thinks the high public debts is less of a problem because these are domestic debts, not international debts. The domestic debts are Singapore government’s borrowing of CPF monies (through bonds issuing). CPF monies come from citizens and PRs. Is there a proper citizen engagement in CPF monies, bonds, debts and returns? This will continue to be a hot topic if the State ignoring engaging Singapore citizens. Citizen engagement is not necessary as the PAP is the best government that knows all the problems in Singapore. In the name of inclusive society, the PAP sets up many feedback channels, either under direct control or through proxy, to show the effectiveness of (false) citizen engagement. However, the five constitutive elements in the past 50 years have narrowed down to State Action. We see only the State is in action not the citizens, for example, the State can suddenly revoke the right to speak at Speakers’ Corner. The State can detain a person with trial under ISA. In the views of the PAP, citizen engagement (e.g. #ReturnmyCPF, Population White Paper etc.) is a dirty word. It prevents the State to achieve higher economic growth, higher aggregate utilities, and it also prevents the distributive justice that the PAP is championing for, e.g. high medical costs, housing, etc. However, for long-term sustainability, Singapore as suggested by WB has to engage her citizens. It is a game changer for development after Lee. SkillsFuture Is Another Innovative Training Guide, another SOP of the PAP. SkillsFuture is a continued training. It is far from the objective of lifelong learning. The PAP is smart in process engineering and SkillsFuture is the latest innovative training guide with additional government funding. SkillsFuture programs, from schools to individual to employers, the funding and support are administrated and initialed by public agencies. It is a guided tour, prearranged, pre-planned process of skill training. Training is different from learning. SkillsFuture cannot run away from skills, job training, employment enrichment, and study improvement, etc. It has a very high content of value for money, productivity for training, and innovation for process engineering. Unfortunately, the word ‘skill’ - no matter past, present and future, is job related, root trained, and memory enhanced. Skill is a mindset training and obedient reinforcement. Passion learning, lifelong learning and non-skill learning are not the key elements here. We have edusave for students to enrich their study and guided overseas trips. These are all approved courses and trips by the Ministry of Education. In term of organisation and planning, these are well planned and trained. It is an innovative process by adding more programs, improving the contents and updating the teaching materials. Students, especially older students can learn more if they can break this process. For example, they are allowed to organise their own tours and backpack their own bags in a small group without strict supervision. After the trip, they can then submit a group report as their social studies/project work for their ‘O’ or ‘A’ level. Students will learn more about Bangkok, Manila, Jakarta and Kuala Lumpur than a guided tour funded by edusave. Similarly, public agencies can only fund approved courses and training programs. The PAP government has already pre-approved these ‘useful’ and innovative job related trainings. They cannot go beyond the guideline. Employees need to mark their attendance so that employers can get the funding grants. This is innovation not creativity. In fact, this is a kind of group thinking. Employees attend the same training, go through the same process and upgrade their skills without learning creatively. SkillsFuture is an update of the PAP model of economic development. It is another way of PAP group thinking in advanced level. It is another systematic organised PAP social engineering. If you disagree, your SkillsFuture Credit remains there, like medisave, it can only be used for approved medical procedures and treatments. The most SkillsFuture can achieve is solving the innovation process engineering problems of Singapore. Our economy still needs people providing ‘standard operating procedures’ services. Our banking, tourism, manufacturing, medical, and even legal sectors need SOP workforce. WDA and other public agencies are good at approving and recognising training courses under the SkillsFuture framework. In fact, the PAP is a SOP party. They organise Singapore in a system that everything is under their control, from mainstream media, preschool education, university places to general election. Unfortunately, SOP has its weakness and it can only help the PAP 50 years. Creativity is the missing point in SkillsFuture. It depends too much on SOP, so do the PAP. Free Internet access, free press and media, and free political defamation will bring more creativity to Singapore than the innovative-only SOP SkillsFuture. In the information age, news reporting is no more a SOP editorial board decision. News reporting and coverage have to consider social media, bloggers, Facebook, twitters, weibo, feedback, forums, etc. Major newspaper, like the New York Times, has now given less power to editorial board but more considerations to social media. However, SkillsFuture is just another SOP product of the PAP. And the SPH and MediaCorp still prefer to follow the SOP of the PAP. No wonder Singapore press ranking is at the third world level with no creative reporting. If you visit skillsfuture.sg, you will find the programs will only be introduced or implemented in 2016. SkillsFuture is still waiting for the SOP of the PAP and perhaps, it is part of the PAP’s general election SOP. Is CPF your money or not your money? Is it like the Chinese writer, YuHua, describing today’s China in his interview? Contradictions and paradoxes. When the PAP government needs your CPF money, it is not your money. When you use the CPF to pay for your property purchase or medical bills, the deduction is real. A simple question in Singapore, under the magic of the PAP, can be quite contradiction and becomes a paradox. The monopoly in politics by the Chinese Communist Party and the People’s Action Party in Singapore in fact leads to more uncertainties. All the time, we know CPF is our money and now the situation becomes more and more uncertain - e.g. withdrawal age. Even PM Lee agreed that CPF is not your money as choice comes with responsibility. Do you spot the “No Smoking” sign and the cigarette box here? You may also recall why the documentary, “ To Singapore With Love’, is censored and the web enterprise, “The Real Singapore”, is allowed to publish with editors taking some risks and some profits. 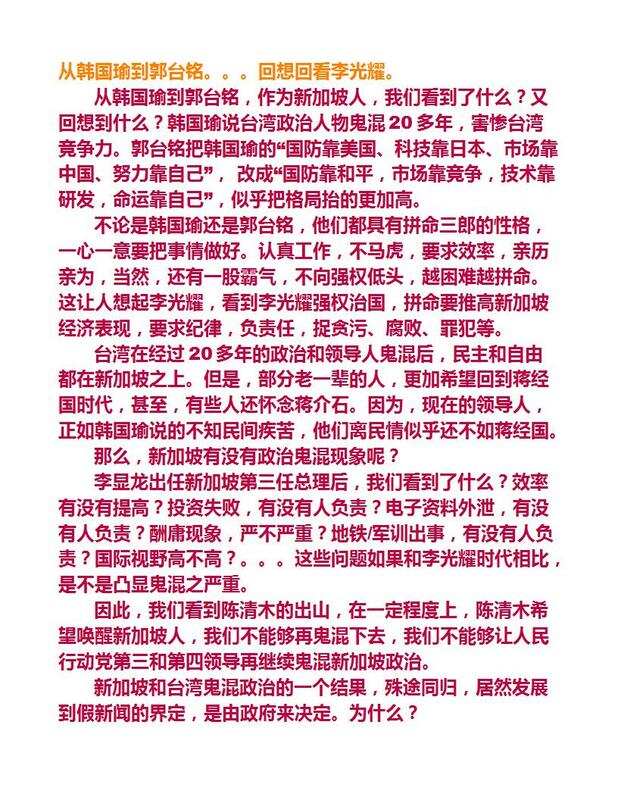 YuHua said the movie “To Live” is censored by civil servants. Their pay will not increase even they approve the public viewing of the movie. However, book publishers (or “The Real Singapore”) have to take risks for profit taking activities. In my previous post, four videos of the interview had already been uploaded. This post will upload the remaining three videos. From the interview, we can understand the recent development in China. Why one party state can lead to uncertainty? Contradictions and paradoxes. The pain of the party is different from the people. The party finds pain in how to remain in power and continue political monopoly. However, people’s pain is daily life and struggle. The party is afraid of change (revolution). From a revolution party, the party now does not wish to see people’s power and changes. Human rights is neglect in a fast moving economy. People are less concerns about social justice unless it involves themselves. China has shifted her focus from economic openness (since 1979) to political control. Current Chinese government has more restrictions on freedom of speech. Check what the Chinese dream is. however, they create ways to break the rule from the bottom up.” YuHua also talked about how Chinese people use foreign websites to get the latest political development in China, like the case of Bo Xilai. You can watch the movie, "To Live", below. Interview with Yuhua. Official translation by HarvardX ChinaX. in the movie, in the novel, "To Live"
you have created one of the great characters of modern times. first against the Communists with the Nationalists, then he turns. won't let a professional doctor care for her in childbirth. I want you to imagine Fugui in the market revolution today. What would he be doing? What would he be suffering? What would he be learning? if you don't want to do bad deeds you cannot be successful. Where would Fugui be living today? in a precarious urban space in China that has been forgotten. they are not local people they are from rural area, migrants. Are he and his wife happy? I think they will be happy. But their destiny might not necessarily bring them together. sort of a Chinese Charlie Chaplin. but his heart is so, so big. Where did you find the character? And do you watch Charlie Chaplin movies? Of course I watch films by Charlie Chaplin, yes. only at the very end did he speak a few words. who were exactly like Fugui. but they still lived pretty well. that can actually represent China of the past. And what about the present and the future? Because I thought Fugui comes off as indestructible. Is Fugui gone from the landscape? I do think Fugui will live on and on. He is such a kind of person that can live on through difficulty. But did you say that your son does not know Fugui in his world? and now we are actually shouldering the responsibility of this economic revolution. So in the future, my son might know someone like Fugui. Where will your son find Fugui in China in his lifetime? in the future maybe my son will also become another Fugui. did you work with him on the movie? It's one of the most beautiful pictures I've ever seen. however when he was shooting the movie I was not there. but you can't see the movie? this is actually an issue full of Chinese characters. You don't need a person with a position higher than that. they get salaries from the country. if they stop them all, it doesn't influence their salary at all. They can put on American movies in the cinemas. There is no economic incentive. so they have to make their own money. while the official in the bureau that oversees movies is unwilling because he has no incentive. while publishing houses must take risk, because only novels that are risky can make them good money. This is a very strange phenomenon in China. and as you look again, you will notice not far away there is a sign that says "no smoking"
This is China. It puts a cigarette dish and a "no smoking" sign side by side. the movie is the non-smoking sign. That is their relationship, they are both side by side. and creative rule breaking at the same time. I can at least say that China is a place full of contradictions and paradoxes. the rules are there but you can violate them anytime you want. it was like this before. It is a county where different things just co-exist at the same time. and you can see everything. and then invent a way to make money getting around it. however, they create ways to break the rule from the bottom up. the great firewall, are definitely the best in the world. to look at overseas websites to find out what was happening. is this a dangerous way to live in China? Or do we exaggerate that? for your best qualities as an artist? I have not discovered that my freedom has not been violated by the government. was under surveillance by the Chinese government. and there is an interesting story. as Mr. Ai Weiwei in Beijing. he responded "Isn't it always the same? I'm pretty much the same as before"
I then said "is the government bothering you these days?" He hemmed and hawed and said "Let's speak about that later, let's speak about that later." it was an officer from the national security bureau, who was following him. Was he worried or did he laugh about it? they don't need political freedom. What is the truth of all this? China will fall into some kind of chaos. however this government is really afraid of revolution. Actually no matter if it is top down or bottom up it will change the destiny of this nation. overturned the Qing dynasty in the 1911, the Xinhai revolution. and you don't even know about them. It would be this sort of situation, a governmentless situation. will we become another authoritarian country again, I really don't know. how does the market revolution end? is the destruction of our homeland. we still need time to figure that out. Our people are losing their health. I don't know about their minds. so I really cannot figure out what is on their mind. surely they are not destroyed? I was half joking and half telling the truth. We end on a Chinese paradox! Yes, we end on a paradox. Just like the paradox of the cigarette dish and the no smoking sign. I am also very happy to see you Christopher, in Shanghai. After we met in New York, I had not thought that I would see you in Shanghai.